It seems ages ago now but back in July I was interning at LongHouse in upstate New York. It might seem like an odd thing to do – take an internship unrelated to my PhD (it was all practical cooking and some blogging) only six months from potentially handing in, but I was in desperate need of a change of scene and some time away from Foucault. And so it was that I found myself in a barn kitchen, baking off trays and trays of Molly O’Neill’s granola. 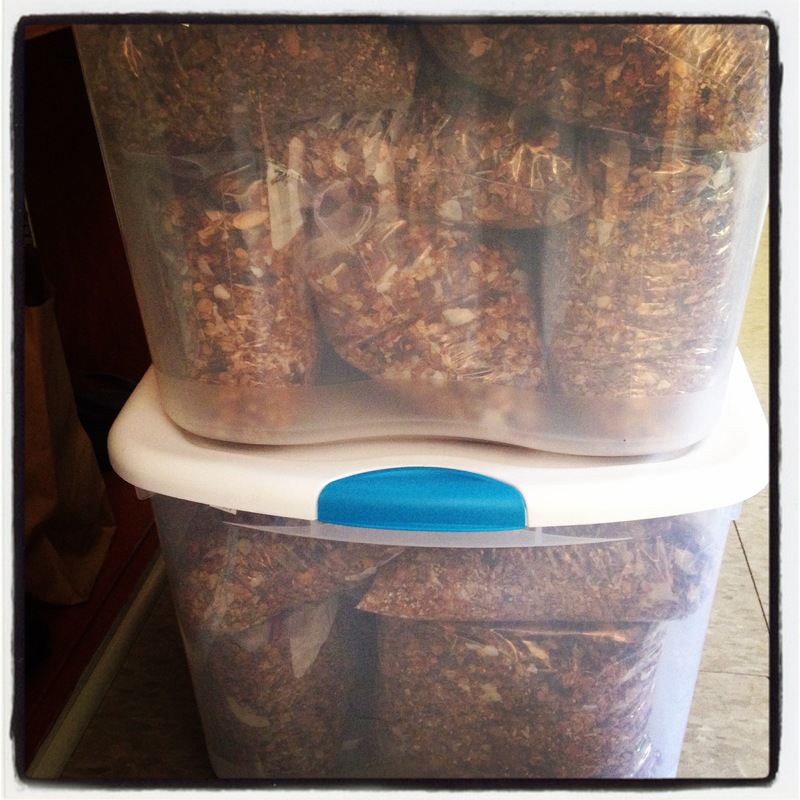 Normally, I make granola in small batches – 200 or 300 grams of oats at a time. Molly requested that I convert a 50 pound bag of oats into granola. She makes it twice a year, hence the vast quantities, and it is used in the LongHouse Food Scholars programme (as a breakfast staple), for visiting guests and other students, and to give away. I, of course, happily agreed to make all the granola. How hard could it be? 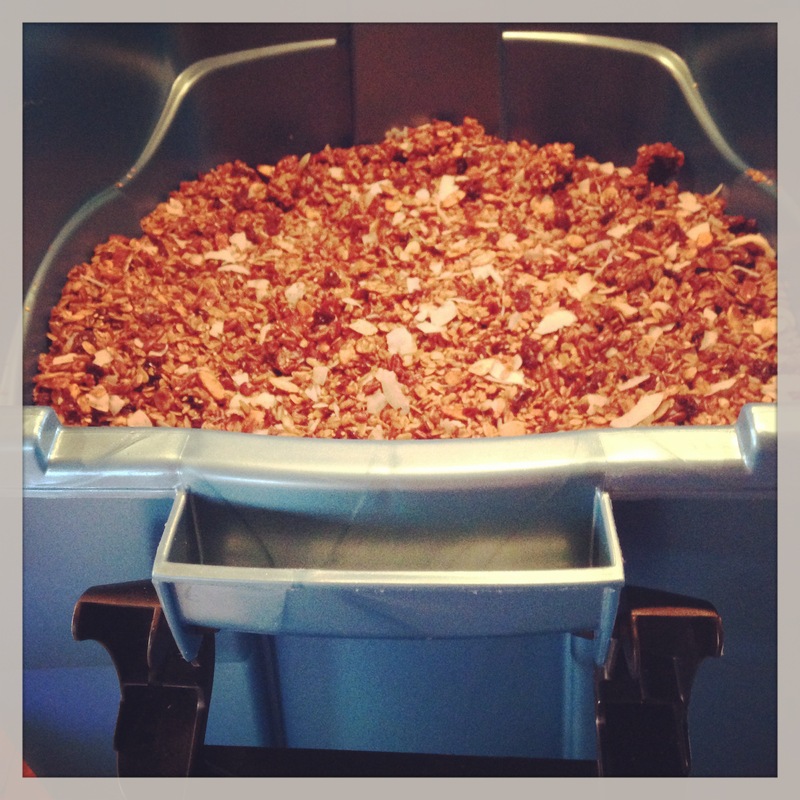 The first mass of granola was baked and put into a large tub. This is where it all started to go wrong of course. We couldn’t find a properly fitting lid for the tub and so we wrapped it as tight as we could in clingfilm. But then students arrived and, instead of bagging it all responsibly into individual bags that were airtight, the granola was forgotten for the long weekend. The result? A request that I bake all the granola again, because moisture had gotten in and made it damp. I was slightly devastated. Hours of my life had to be relived! Part of me wanted to cry. Another part of me wanted to refuse. A third part of me wanted to lie down on the floor and not move for several days. But I took a deep breath and got on with it. By this time we had had to move kitchens. Initially I baked at Molly’s – in her new ovens. I was doing okay here but then, with the darkening light, I managed to over-bake several trays. Then the organising board on the fancy ovens gave up working and had to be replaced, so I moved to a third kitchen. These new ovens were temperamental and so required a more watchful eye. But slowly slowly, after several days, all the granola was baked to the right golden colour and dry. I was so paranoid about damp granola by this stage that I checked and re-checked all the trays as they came out of the oven. And sometimes put them back in for a few minutes, you know, just in case. We then spent an afternoon filling sealable bags with granola so that it would stay dry and could be used throughout the late summer. After that experience, making granola for hours at a time over several weeks, I was well and truly granola-ed out. I continued to eat it – Molly’s granola is exceptionally more-ish, but I didn’t want to have to make any more for a LONG time. Finally, this week, I decided it was time to venture forth into granola again. I often need something quick and simple for breakfast, before dashing to the office. I am highly dysfunctional in the mornings. If I can work from home, I do. I tend to be more effective if I can just get up, have a coffee and sit at my desk in my pyjamas for a few hours. If I have to get dressed, eat and leave, then I need my life to be as easy and straight-forward as possible. 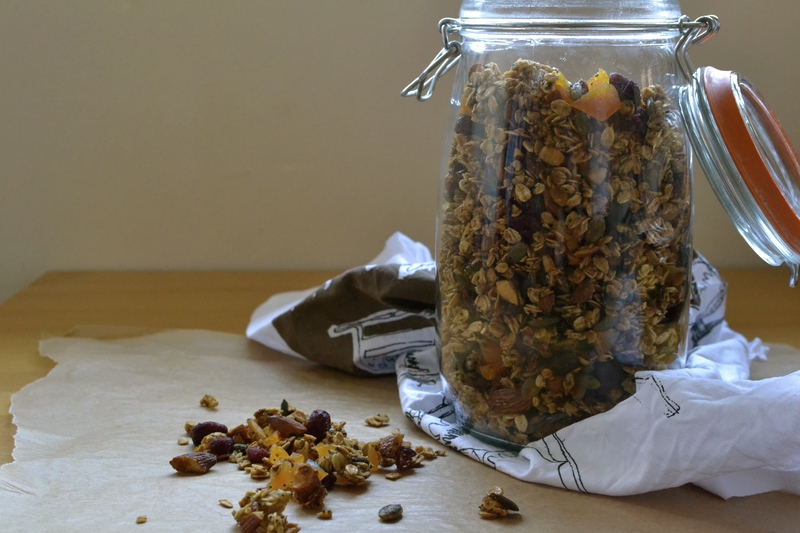 This granola is adapted from Nigella’s book, Feast. Feast is one of my favourites – I love the writing and the organisation and the recipes. It’s my go to book – the one that came in my suitcase when I moved over from South Africa. Nigella writes that she got the granola recipe from a place in Connecticut called The Pantry. This granola is spicy and warm, and, with the addition of cranberries, rather than raisins, reminiscent of Christmas. It’s certainly my December choice. I only made half the quantity she describes, mainly because I don’t need that much granola at a time. I left out raisins, sunflower and sesame seeds (because I thought I’d use what I already had), and reduced the amount of sugar. Nigella mixes everything together in one bowl but I heated up the apple compote with the sugars and oil because mine was frozen. Heat the oven to 160C and line the oven baking tray with baking paper. Put all the dry ingredients, except the dried fruit, into a bowl and stir to distribute. Place the apple compote, golden syrup, honey, brown sugar and rapeseed oil in a pan and heat until everything is emulsified. Pour this into the dry ingredients and stir, making sure everything is evenly coated. Place the mixture onto the baking tray, distributing it evenly. Cook for approximately 40 minutes, until the granola is evenly golden brown. Stir every 15 minutes or so. This timing will really depend on your oven. Once it’s baked to desired goldenness, remove from the oven and leave to cool completely before stirring in the fruit. Store in an airtight container.